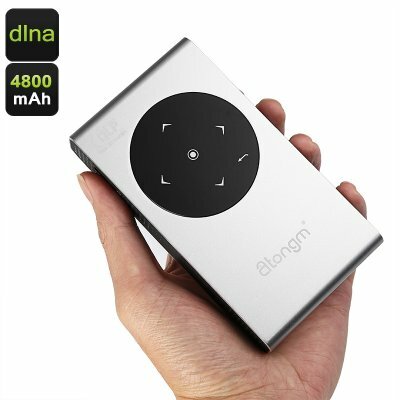 Successfully Added Atongm M6 Mini Projector - Linux OS, WiFi, 720p, 100 Lumens, Touchpad, Miracast, DLNA, Airplay, Quad-Core, 4800mAh to your Shopping Cart. The Atongm M6 mini projector lets you turn any dark room into your own private cinema. This compact DLP projector features a very small and lightweight design. It comes with a powerful 4800mAh battery that treats you to up to 4 hours of usage time. Thanks to this, you can use your mini projector anywhere you are without the need for an external power supply. With its Linux operating system, this HD projector is so much more than your regular LED projector. It furthermore comes with Miracast, Airplay, and DLNA. Whether you use this beauty for watching a movie or giving a presentation, it is sure to meet your demands. This advanced mini projector produces up to 100 lumens and treats you to crisp HD images in a 720p resolution. With its large image size, it truly treats you to a cinematic experience. The Atongm M6 mini projector comes with a sleek design and features an intergraded touchpad for easy control. With its OTG USB and 64GB SD card support, you’ll be able to easily insert all your media. Thanks to its sophisticated hardware, your mini projector can handle all your media demands without dropping a frame. It supports WiFi for browsing the web and treats you to built-in speakers for a great audio-visual experience. The Atongm M6 mini projector comes with a 12 months warranty, brought to you by the leader in electronic devices as well as wholesale electronic gadgets..